The Santa Fe, N.M., area is world-renowned for its contribution to and love of the arts, and a special sensitivity to Mother Nature’s treasures. Given that ideal, it’s only fitting the region would also be home to golf courses that could be considered art in their own right, through solid design and routings in high-desert surroundings. Two of the area’s courses – the Towa Golf Club, located on the expansive Buffalo Thunder Resort and Casino, and the city-owned and -operated Marty Sanchez Links de Santa Fe – illustrate that finding the delicate balance of golf and nature can be benefit all interests. Both of these venues are among the top tracks in the state and fit in great with a trip to Santa Fe. 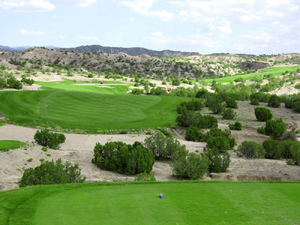 Located in the scenic Pojoaque Valley on tribal land of the Pojoaque Pueblo, Towa Golf Club features three nine-hole tracks; another nine will open for play in mid-2012. The courses surround the opulent Buffalo Thunder Resort, New Mexico’s largest and most expensive resort, with an estimated cost of more than $250 million. The property is owned by the Pojoaque Pueblo (which also owns the nearby Cities of Gold Casino & Hotel), and has a Native American feel throughout. Towa is made up of four nine-hole tracks: Boulder and Piñon (both which opened in 2001), Valley (2009) and the Butterfly Nine, which opened in 2005 and is currently closed for improvements and set to reopen in 2012. Once the improvements are finished on the Butterfly Nine, the Boulder Nine will be renovated as part a rotation to keep Towa in constant prime condition. The rolling land here is crossed and bordered by ball-grabbing, red-dirt arroyos and indigenous piñon trees. Sandstone rock formations also enter play among a series of ridges that dissect the courses as the Sangre de Cristo and Jemez Mountains provide scenic golf backdrops and way-out-there views. Most of the tee boxes are elevated, and the putting surfaces, which can be demanding, are often raised from the fairways as well. You won’t find huge mounds or ridges on the greens, but subtle breaks make golfers think twice about their reads as the round rolls by. Three-time U.S. Open winner Hale Irwin designed the Valley and Piñon nines, while Tucson-based landscape architect and golf course designer Bill Phillips fashioned Boulder and Butterfly. All the courses at Towa GC play to a par of 36 and each features five sets of tees. The Piñon Nine stretches 3,585 yards from the tips while the Valley Nine weighs in at 3,377 yards. Those two courses sport the easiest combined rating (71.2) and slope (126). The Boulder Nine, so named because of the amazing rock formations that frame it, measures 3,558 yards from the back tees and is the hardest course at Towa Golf Club. In combination with Valley, it’s rated 71.6 with a slope of 132, while paired with the Piñon jumps up to 72.8 and 135, respectively. Butterfly extends 3,380 yards. The first hole of the Piñon Nine is a breathtaking, downhill 631-yard par-5. The 186-yard par-3 fourth hole on Boulder has an 8,200-square-foot island green, the only such putting surface in New Mexico. The green is in the middle of a huge irrigation lake and surrounded by sand to keep slightly wayward shots out of the water. There are three two-shotters on Boulder that play more than 400 yards (capped by the tough 444-yard seventh). Piñon’s highlights include the 460-yard but downhill, par-4 fourth and the 442-yard, dead-straight par-4 seventh. The Valley Nine’s hardest hole is the 488-yard par-4 fourth, which is sandwiched between two reachable par-4s – the 318-yard third and No. 6, which plays downhill to 357 yards. Most of Towa GC’s holes look more difficult from the tee than they really are. The secret, simply, is to stay out of the desert, avoid hitting through doglegs, and keep your focus on the shot at hand, not the 360-degree panoramas. Towa GC also offers a practice facility with a driving range situated so players will never find the sun in their eyes and a 7,300-square-foot clubhouse with a dining room and bar as well as an outdoor patio area. Towa Golf Club and the Buffalo Thunder Resort are in the heart of beautiful Northern New Mexico, about nine miles north of Santa Fe. 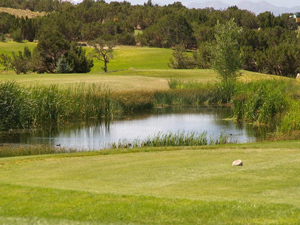 For more information about the course and the resort, go to Buffalo Thunder’s website at www.buffalothunderresort.com. The city-owned Marty Sanchez Links de Santa Fe golf course on the western edge of Santa Fe is a scenic haven among the rolling hills and evergreen trees in a valley with four mountain ranges – the Sangre de Cristo, Jemez, Sandia and Ortiz Mountains. Playing 7,405 yards from the tips, the par-72 course is a great place for new golfers as well as seasoned veterans. The manicured fairways of the inland links follow the natural contours of the land and weave in and out of the native juniper and piñon trees, leaving little room for error. Native grasses separate fairways, many of which have raised sides to help shots more easily find the short grass. “Marty,” as locals call the track named after a former Santa Fe amateur champion who died of cancer in young adulthood, offers a country-club experience at “muni” prices. Designed by Baxter Spann (the architect who later built the much-ballyhooed Black Mesa Golf Club about 20 miles to the north), Marty Sanchez Links de Santa Fe is a gorgeous yet testy journey punctuated by massive greenside bunkers. Many consider it one of the best municipal courses in the Southwest. The moment you approach the first tee, you’ll be knocked out by the mountain views, a stunning feature that remains constant through the round. The opening stretch of holes at Marty asks for your best game. The opener, a 565-yard, uphill par-5 doglegs slightly to the left and is the course’s No. 1 handicap hole. The fourth is the most difficult par-3 on the course. From the tips its 245 yards test go only a bit downhill; water lurks all along the left and there’s no bail-out area on the right. The 465-yard, par-4 ninth asks for both length and precision as trees block your path to the green if you stray too far right off the tee. There are also bunkers left and short of this green. The 420-yard, par-4 10th runs straight uphill past a large fairway bunker along the left of a narrow driving area. The green is partially hidden by the severe slope, and there are sand traps right and a large grass bunker left of the putting surface. “Marty” has its own version of a Final Four, as three par-4s of 465, 435 and 485 yards, Nos. 15, 16 and 18, respectively, are combined with a 590-yard par-5 to create a memorable ending stretch. The closing hole may be the toughest of the bunch, as there are three fairway bunkers to avoid left off the tee and a large slope on the right that will return a shot that’s a little left back into the fairway. There’s also a large lake on the right and a large bunker right, both of which must be avoided at all costs. 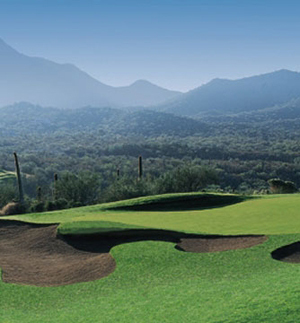 Marty Sanchez Links de Santa Fe carries a rating of 73.0 and a slope of 129 from the back tees. The putting surfaces are bentgrass and the fairways Bermuda. It’s a great course and an easy place to have a fun, if somewhat demanding, round of golf. For more information about Marty Sanchez Links de Santa Fe, visit www.linksdesantafe.com. This entry was posted in Golf, Santa Fe Recreation and tagged Buffalo Thunder, Buffalo Thunder Golf, Karen Meredith, Karen Meredith Prudential Santa Fe Real Estate, Living in Santa Fe, Living in Santa Fe New Mexico, Living in Santa Fe NM, Marty Sanches Links de Santa Fe, Marty Sanchez Golf, Santa Fe Golf, Santa Fe Golf Courses, Santa Fe Recreation, Towa Golf Club, Towa Golf Course on March 27, 2011 by karenbmeredith.